Tough weekend for us in Formula 1 betting last week as our tip for the German GP, Sebastian Vettel, crashed out of the race while in the lead. The tour rolls on this weekend as we head to the Hungaroring in Mogyoród for the 2018 Hungarian Grand Prix. We take a look at the race in full and give our betting tips below. 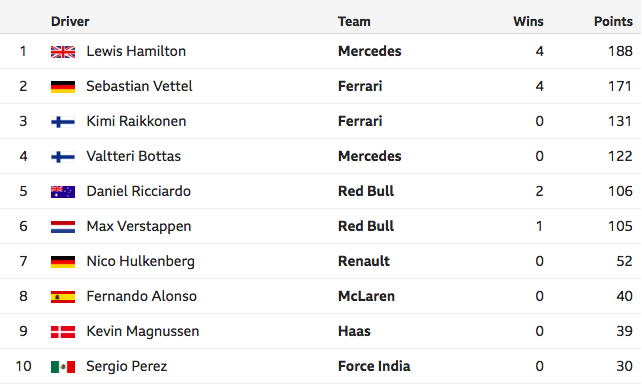 Lewis Hamilton capatilised on the Sebastian Vettel mistake in Germany to take take out the race and in turn take a 17 point lead in the drivers championship. In fact, Mercedes went one-two in Germany as teammate Valtteri Bottas was able to pick up second place. A second retirement in the last three races for Daniel Ricciardo saw him slip to fifth place in the drivers championship and starved of a podium finish for the fifth straight race. The Hungaroring has played host to the Hungarian Grand Prix every year since 1986. The 2018 edition will be the last event before the mid season F1 summer break, so drivers will be keen to go into the holiday period on a high. The track recently underwent a resurfacing and has been described as a slower overall track than most on the F1 circuit. Only three drivers have won in the last six years at the Hungaroring. Sebastian Vettel, Lewis Hamilton and Daniel Ricciardo have all saluted, with the only other active drivers to have won the race being Fernando Alonso and Kimi Raikkonen. Ricciardo will be desperate to prove his worth this weekend after a few lackluster performances throughout the last month of racing. He won the Monaco GP in May in a race that also required plenty of mental fortitude after suffering a power problem mid-way through the race but soldiering on for the victory. Hamilton and Vettel obviously start as favourites here and rightly so after their shared dominance over the past five races. However, I just think Ricciardo has a chip on his shoulder after being taken out by his teammate last weekend and is great value after a few poor events. Since winning the event in 2014, Ricciardo has a great record at the Hungarian GP. He has finished on the podium in two out of three races since then and was a fast qualifier last year before being forced to retire. Back him to stand on the podium this year.